If you don’t want to make a pizza from scratch, then use bottled pizza sauce, and a pre-bought crust, but whatever you do, Please make the fresh Moxarella Cheese. It’s nearly instant. Homemade Vegan Moxarella, without any artificial anything. It browns and stretches. Individual Pizzas Make Everyone Happy! This Recipe Makes 4 individual pizzas. Don’t forget to have fresh tomatoes and basil on hand. First, start the dough. 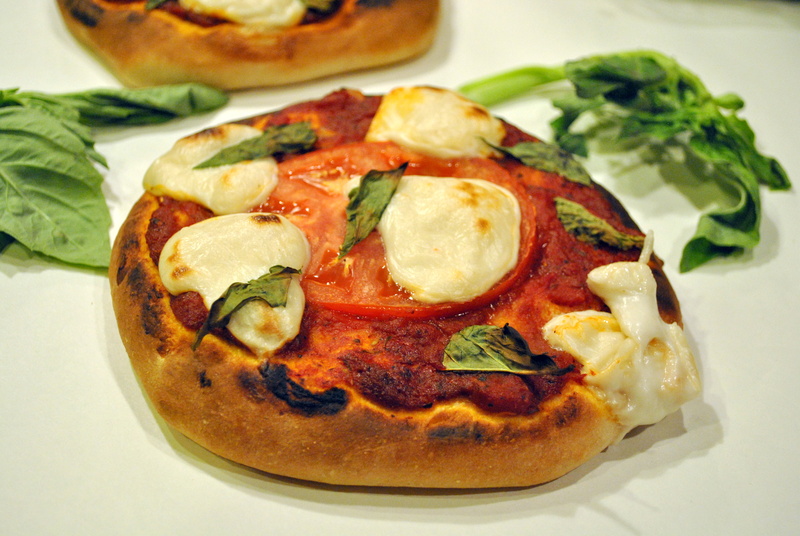 This crust contains gluten, for several gluten free crust options, click here. Method: Combine all ingredients and knead for 10 minutes. Cover and let rise in a warm place for 60 minutes until doubled. 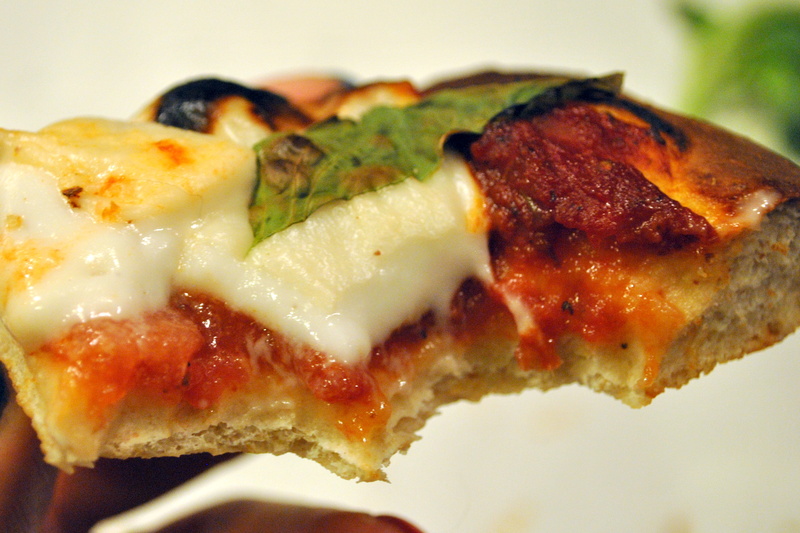 While the dough is rising, make the pizza sauce and the fresh moxarella cheese. Method: saute the garlic in a little vegetable broth or the olive oil in a small saucepan for a minute or two on medium heat. Add all the other ingredients. Reduce heat to low and let simmer while you make the Moxarella Cheese. I wanted to call this “Foxy Moxy,” but that name has been taken by some unsavory characters on the web…. This cheese stays in a “melted” type form until baked, and then it forms a nice crust, like dairy cheese does. It’s not intended to be eaten plain (like real dairy fresh mozzarella can). It’s also fairly salty to make it stand out in your recipes, if you prefer less salt, please feel free to reduce to 1/2 teaspoon, or less, but the flavor won’t be as pronounced. Method: Blend all ingredients together in a high speed blender until completely smooth, about 1 minute. 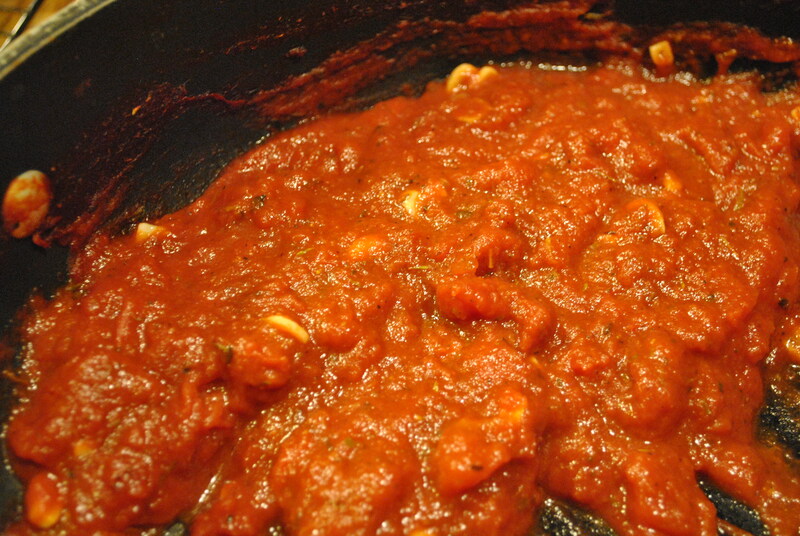 Pour into a small saucepan and cook, stirring constantly over medium high heat. After a couple of minutes the mixture will start to look weird, like it’s curdling or separating. This is totally normal, reduce heat to medium and KEEP stirring so you don’t burn the cheese to the bottom of the pot. Keep cooking and stirring til really thick (about 2-3 more minutes) and the mixture becomes like a cohesive mass of melted dairy cheese and stretches like in the photo below. Remove from heat and let cool a bit while you assemble the pizzas. Moxarella stores well in a sealed container in the fridge for a few days and can be used to make excellent grilled cheese sandwiches, mac and cheese, etc…. Assembly: Your dough should be nearly ready now, so when it hits 60 minutes or is doubled, punch it down and divide it into four pieces. Preheat the oven to 500°. 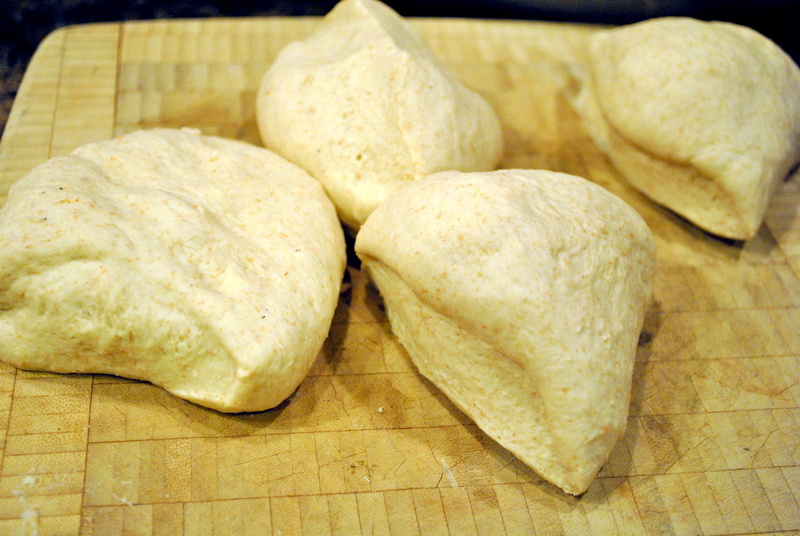 Roll out the dough on a floured surface as thin or thick as you like. We opted for thicker pizzas this round. Spread each pizza with 1/4 of the pizza sauce. 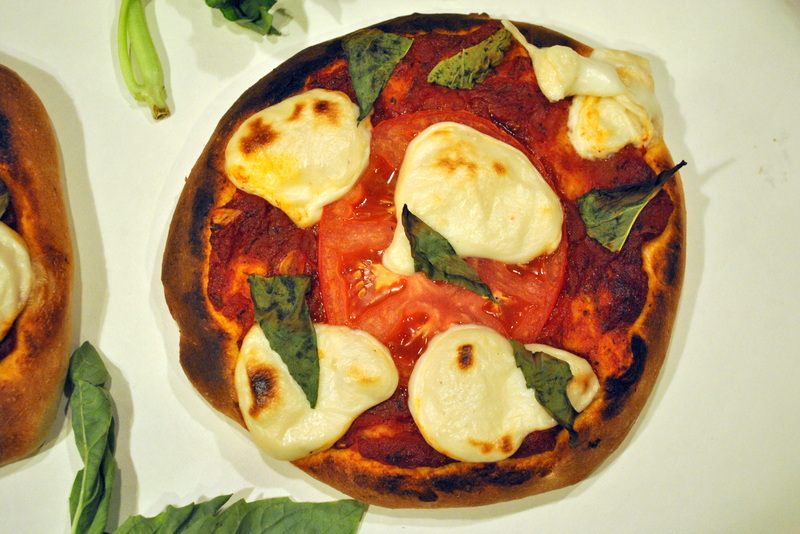 Top with fresh tomato slices, dollops of the fresh moxarella cheese and fresh basil leaves like shown in the photo below. 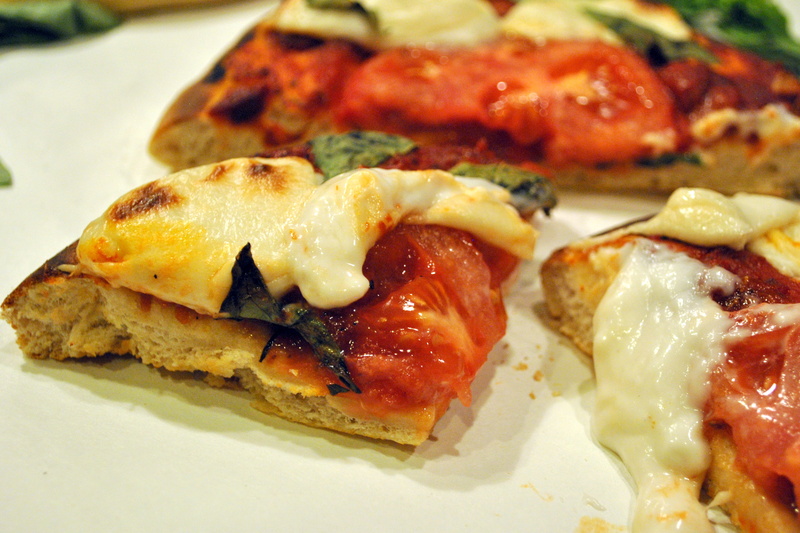 Bake individual pizzas for 10-12 minutes on a baking sheet until cheese and the crusts are nicely browned. Note: there is a very fine line between nicely browned and burnt here, so please, watch your pizzas carefully. 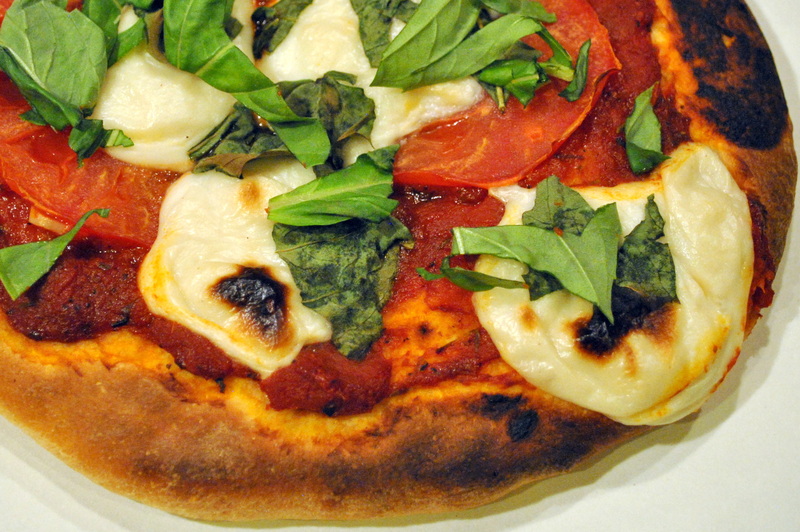 Sprinkle pizzas with a bit of additional chopped fresh basil once out of the oven if desired. I won’t take any responsibility for anyone burning their mouth on hot cheese. Has anyone tried partially freezing and then shredding for pizza? Good grief, this was AWESOME! Thank you! Can’t believe how easy it is and it is really delicious! I just found your site and am so EXCITED to try your cheese. I am the only vegan in my house, so I was wondering if you thought I could freeze your Moxy mozzarella recipe. That way I would not waste any. I could also make some pizzas and put par baked pizzas in the freezer for an even quicker meal. Thank-you for any help. Thank you SO much for this recipe! I made the moxarella cheese tonight and it was a hit. I left the oil out with no problem. Hi! Does ‘2 1/4 t. active dry yeast (1 packet)’ mean 2x 1/4 tsp yeast – meaning 1/2 tsp yeast? Or 1 packet of the regular 8g yeast? It means 2 teaspoons plus 1/4 teaspoon active dry yeast. This looks yummy! Thanks for sharing your recipe! This is the first time I’ve ever commented on ANYTHING, but the moxxarella recipe is literally life-changing. I can’t get over how good it is. I made it for pizza, but I ended up eating it as queso dip straight out of the pot. Absolutely fantastic, thank you so much! This IS the vegan mozzarella you have been looking for! It really is gooey, stretchy, and super tasty, and very easy and fast to put together. I was literally spooning it out of the pan and eating it on the spot. I also broiled some on a piece of good bread with olive oil and tomatoes and it browns and “crusts” up wonderfully. After trying several other cashew or macadamia nut ($$$) heavy recipes that ended up sort of pasty after cooking, THIS is the vegan cheese you want on your pizza! THANK YOU for this awesome recipe. NOTE: I forgot to add the olive oil and it came out just fine, in my opinion. I’ll add it next time to see what the difference is, but I’m quite happy with the way it turned out. I found your recipe in Sam blog and asked the same question from her. I would be grateful if you could help me. You can use cornstarch or potato starch. It just won’t have the same stretchy result. i’m also interested to know if it can be freezed, and how, in dollops? I’ve never tried freezing the moxarella. Let me know if you try it! What if I want to buy pre ground cashews and then use a blender? Would that work? And how much would I use in that case? Of course. I would use a lightly packed quarter cup. Can I use macadamia nuts instead of cashews? Of course! 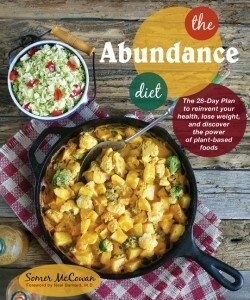 I’ve used blanched almonds, toasted sunflower seeds, hemp seeds and coconut milk too with great results. I’m making this pizza tomorrow. Instead of the agave, can I use maple syrup?? It’s just basically to make the yeast activate, right?? Did you ever try making the ‘cheese’ with different kinds of nuts? I’ve made it with almonds, hemp seeds, pumpkin seeds, sunflower seeds and coconut milk in place of the cashews. Just sub the same amount. whoa! really good that moxarella!! I’ve added a tsp of apple cider vinergar to the recipe… try it out! really tasty. Thanks for this awesome recipe.